The most common way to travel between Italy and Greece is by ferry. There are several Italian ports from which you can choose to take a ferry to Greece, Croatia, and other Mediterranean destinations. Following the introductions to these ports, you'll find a list of ferry booking sites that you can use to check schedules and book your trip. Not all ferries run every day of the week so be sure to check the schedules carefully. Most ferries have a restaurant and bar but you can take your own food and drink on board to save money. Brindisi is probably the Italian port most commonly associated with taking a ferry to Greece and has the most options. Frequent ferries leave Brindisi for Corfu, Kefalonia, Igoumenitsa, and Patras. It's possible to get between Brindisi and Corfu (the closest Greek port) in as little as 6 1/2 hours. Departure times range from 11:00 to 23:00. Brindisi, in the heel of the boot, is the most southern Italian ferry port. See Puglia map for location. From Bari, you can take a ferry to Corfu, Igoumenitsa, and Patras in Greece and Dubrovnik, Split, and other ports in Croatia as well as to Albania. Most ferries leave in the evening and have cabins for sleeping as well as a bar and sometimes a restaurant. The fastest ferries travel between Bari and Corfu in about 8 hours. Bari's ferry port is near the interesting historic center, centro storico, a good place to do some exploring before your departure. Near the port, try Hosteria al Gambero if you have time for a meal. Bari is also in Puglia, in southern Italy. Find out more with our Bari Travel Guide. 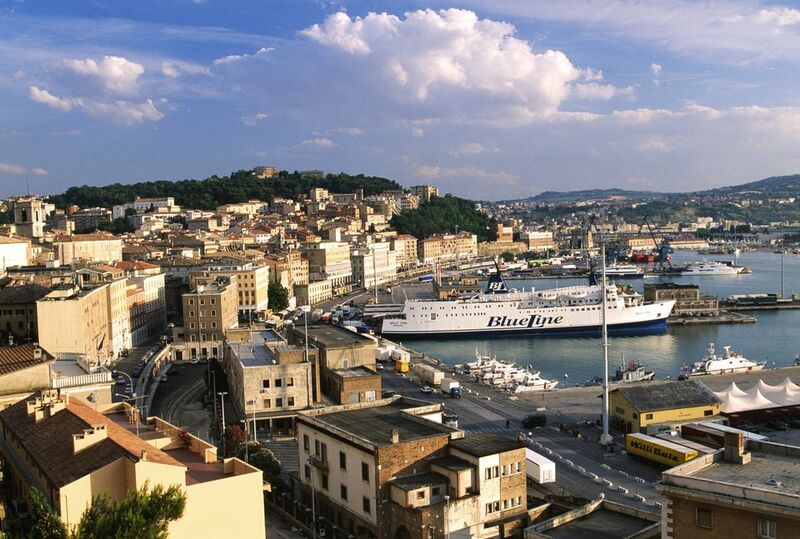 If you're in central Italy, Ancona may be the most convenient Italian port. From Ancona, ferries go to Igoumenitsa (taking 15 to 20 hours) and Patras (taking 20 to 23 hours) in Greece. Ferries also go to several ports in Croatia. Ancona is in the Marche region; see Marche map for location. From Venice, you can take a ferry directly to Corfu, Igoumenitsa or Patras. Taking a ferry from Venice is a nice alternative if you want to visit Venice. Ferries usually leave Venice in the evening and take close to 24 hours (or longer to Patras). If you arrive in Venice by bus to take the ferry, there is usually a shuttle service between Venice's bus terminal and the ferry terminal. If you're already in Venice, you'll need to take a Vaporetto or water bus. Plan your trip with our Venice Travel Guide and find out what to see in top Venice attractions. It's usually a good idea to book your ferry ahead, especially on high season dates and if you want a cabin or plan to take your car, but sometimes it's possible to buy your ticket at the port on the day of departure. Some overnight ferries allow passengers to sleep on deck but some require you to book a seat or bed. Ferries usually start boarding two hours before departure but check the ferry company information to be sure. If your goal is to get to Athens or many of the Greek islands, it's usually easier and quicker to fly directly to Athens. Some of the budget airlines offer fairly inexpensive fares from many Italian cities.